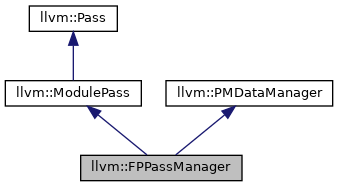 FPPassManager manages BBPassManagers and FunctionPasses. It batches all function passes and basic block pass managers together and sequence them to process one function at a time before processing next function. Definition at line 466 of file LegacyPassManagers.h. Definition at line 469 of file LegacyPassManagers.h. References cleanup(), llvm::Pass::doFinalization(), llvm::Pass::doInitialization(), F(), and runOnFunction(). cleanup - After running all passes, clean up pass manager cache. Definition at line 1557 of file LegacyPassManager.cpp. References assert(), llvm::AnalysisResolver::clearAnalysisImpls(), and llvm::Pass::getResolver(). Definition at line 1699 of file LegacyPassManager.cpp. References llvm::legacy::FunctionPassManagerImpl::add(), assert(), llvm::legacy::FunctionPassManagerImpl::doFinalization(), llvm::legacy::FunctionPassManagerImpl::doInitialization(), llvm::EXECUTION_MSG, llvm::Module::getInstructionCount(), llvm::Module::getModuleIdentifier(), llvm::Module::getName(), llvm::Pass::getPassID(), llvm::getPassTimer(), llvm::Pass::getPotentialPassManagerType(), InstrCount, llvm::PassInfo::isAnalysis(), llvm::MODIFICATION_MSG, llvm::ON_MODULE_MSG, P, llvm::PMT_ModulePassManager, llvm::SmallVectorTemplateBase< T >::push_back(), llvm::legacy::FunctionPassManagerImpl::releaseMemoryOnTheFly(), llvm::legacy::FunctionPassManagerImpl::run(), llvm::ModulePass::runOnModule(), llvm::PMTopLevelManager::setLastUser(), llvm::PMDataManager::setTopLevelManager(), llvm::Module::shouldEmitInstrCountChangedRemark(), and X. Definition at line 1690 of file LegacyPassManager.cpp. Print passes managed by this manager. Definition at line 1601 of file LegacyPassManager.cpp. References llvm::dbgs(), llvm::Pass::dumpPassStructure(), and llvm::raw_ostream::indent(). Definition at line 502 of file LegacyPassManagers.h. Definition at line 499 of file LegacyPassManagers.h. Definition at line 498 of file LegacyPassManagers.h. Definition at line 511 of file LegacyPassManagers.h. Definition at line 517 of file LegacyPassManagers.h. Definition at line 509 of file LegacyPassManagers.h. Execute all of the passes scheduled for execution by invoking runOnFunction method. Keep track of whether any of the passes modifies the function, and if so, return true. Definition at line 1614 of file LegacyPassManager.cpp. References llvm::EXECUTION_MSG, llvm::Function::getInstructionCount(), llvm::Value::getName(), llvm::GlobalValue::getParent(), llvm::Pass::getPassName(), llvm::getPassTimer(), InstrCount, llvm::GlobalValue::isDeclaration(), llvm::MODIFICATION_MSG, llvm::ON_FUNCTION_MSG, llvm::FunctionPass::runOnFunction(), llvm::Module::shouldEmitInstrCountChangedRemark(), and X. Definition at line 1680 of file LegacyPassManager.cpp. Definition at line 468 of file LegacyPassManagers.h.